“Your husband gave us a tour of your boat last night; she’s beautiful and appears very capable. And I love your bathtub,” the redhead said eyeing their custom figurehead and swinging gently from the forestay. “I know. It is just wonderful. We put in a new water heater recently. I need a lot of hot water. We have a washer/dryer too, you know,” replied the woman on the dock, as she sipped at her Scotch. “Really? We have a washer/dryer too!” she responded, remembering not to mention that they had not yet tried it out. Her mini skirt fluttered in the breeze. The woman below raised her cocktail in solidarity. This was one of those moments. The instant in which I do not relate to myself as my self, but rather objectively, as though watching a character in a movie. The “she” in the story was, in fact, me. I have made efforts to observe myself objectively for years, attempting to consciously create moments such as this one. I have struggled, usually without success, to be non-identified, to study my thoughts and behaviors in an analytical way. Detached yet present. In the aforementioned moment, I achieved this. So blatantly absurd in relation to the rest of my life was this moment, that the possibility of not “seeing” myself vanished. Who was this 44 year old woman aboard a 44’ sailboat, chatting it up and comparing amenities with another yachtie? Certainly nobody I recognized or identified as “me.” This particular I (one of many) is one I never dreamed I would become. And the rest of my I's seem to like her. She’s odd. Unexpected. Entertaining. The culmination of events that led me here could never have been predicted by a past incarnation of "me" much less be guessed by any outside observer. My path through the obstacle course of life has been erratic and roundabout, punctuated with adventures and misadventures, broken bones and broken hearts, and a few short periods of calm in which very little occurred at all. I once heard of a society which views their orientation to time as backwards from ours; they face the past and move into the future without seeing where they are going. They know where they have been, but what lies ahead is always a mystery. I think this may be correct. I never could have seen this life, this person, coming! And yet, somehow I am inevitably exactly who I have always been, as unreal as it may seem sometimes. 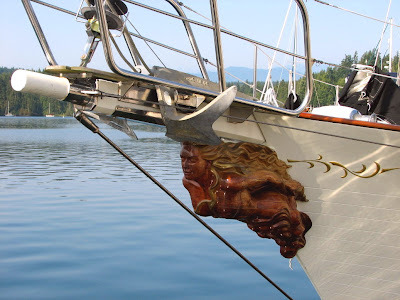 In reality, we are ripping the forepeak of the boat apart for installation of a new holding tank while docked in Port Ludlow, a beautiful harbor with a friendly marina. Herons abound, the water is clean, clear, and filled with thousands of little fishies. We spend the evenings watching boats come and go from the anchorage, and the marina regulars are charming and helpful. The first photo is of Enchantress, a 49’ Liberty sloop owned by Myndi Morgan and Steve Cross. 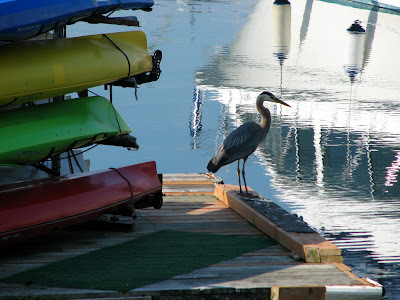 The heron, who is owned by no one, is the self-assigned sentinel of the kayak dock. PS: If anybody knows of the culture I refer to (which escapes me at the moment) please respond. I’d love to refresh my information bank. That tidbit came from a musty old catalog card from the farback of my memory. I feel like all I can do is see my self objectively - I'm always a character in a play. I'm working away from this. A conversation for some time. Lovely post and love the shot of the kayaks - so many colors. Kind of like life, huh?